This year I decided to cook Cato’s Globi (Pastry Balls) as Hadrian’s birthday cake. Mix the cheese and spelt in the same way (as Libum), sufficient to make the number desired. Pour lard into a hot copper vessel, and fry one or two at a time, turning them frequently with two rods, and remove when done. Spread with honey, sprinkle with poppy-seed, and serve. Sift the flour into a bowl. Beat the cheese until it’s soft and stir it into the flour along with the egg. Form a soft dough. Break of small pieces and roll each of these in your hands, forming balls about 2.5 cm/1 inch in diameter. Prepare a simple deep-fryer in a saucepan using olive oil which will need to be at least 2.5 cm deep. When the oil is hot, but not smoking, gently drop 2 or 3 pastry balls into the oil and turn them occasionally until they are golden-brown on the outside. Lift from the oil and drain on paper towels. Cook the rest of the pastry balls in the same way. Heat the honey in a frying pan until it is very runny. Pour the poppy seeds and the sesame seeds onto a plate, roll the balls in the honey until thoroughly coasted. Roll in the roasted sesame seeds or the poppy seeds. These pastry balls are delicious eaten either hot or cold. 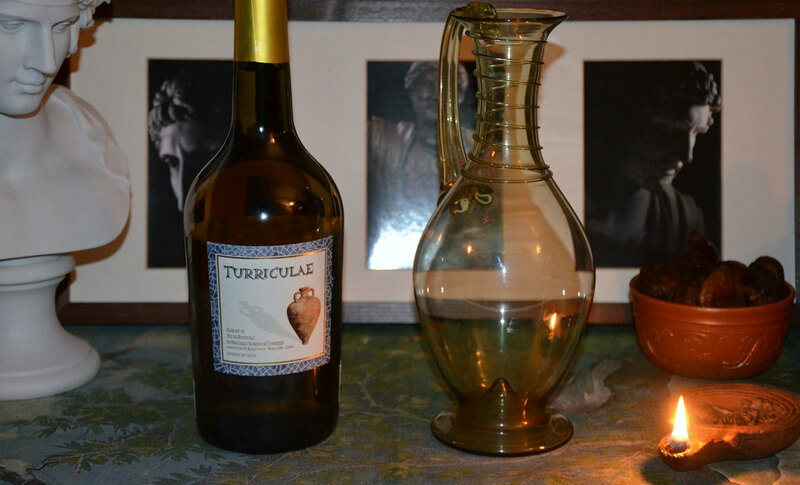 In celebration of Hadrian’s birthday I also opened a bottle of Turriculae. Turriculae is today produced by the archeological site and roman vineyard Mas des Tourelles in southern France and is made according to a recipe from Columella in which seawater and defrutum (grape juice boiled down to a third of its original volume) are added to the wine which is then aromatized with fenugreek. 1,900 years ago, Hadrian was celebrating his first birthday since his accession to the imperial throne. He was forty-two. After a short stay at Nicaea and Nicomedia (see here and here), Hadrian probably wintered in Byzantium, the city which would become the “second Rome” two centuries later. Hadrian would later give Byzantium an aqueduct to bring water supply to the city from the forests bordering the Black Sea, 24 kilometres away. The aqueduct is now called after the emperor who restored the monument; the Aqueduct of Valens. The Valens Aqueduct in Istanbul. If you ever find the time in your busy schedule, a youtube video of your roman cooking would be fantastic!